Driving up to Junction on twenty miles of bad road, we stopped for directions at a gas station and picked up an older woman waiting for a ride who guided us the rest of the way. A mile or two later, we turned a corner and saw a line of wind turbines on the slopes of Don Figeroa Mountain, the Wigton wind project (http://www.mct.gov.jm/energy_5.htm). I turned in my seat and asked the woman on her way to Junction whether the wind machines had made any difference. She said, "No, mon, we still have to pay for the electric and the gas." A little farther down the road we passed a sign for DigiCel, the local cell phone company. I turned to her again and said, "But the cell phone changed everything, didn't it?" She smiled widely and nodded deeply. On the sun porch and veranda, we videotaped the solar electric light system we'd brought. We showed the three different sizes of interconnecting solar panels and LED lamps with batteries in their cases and displayed the different sets of connectors. We had one connector to go from the battery to a USB device, another was a 12 volt socket like a car lighter. 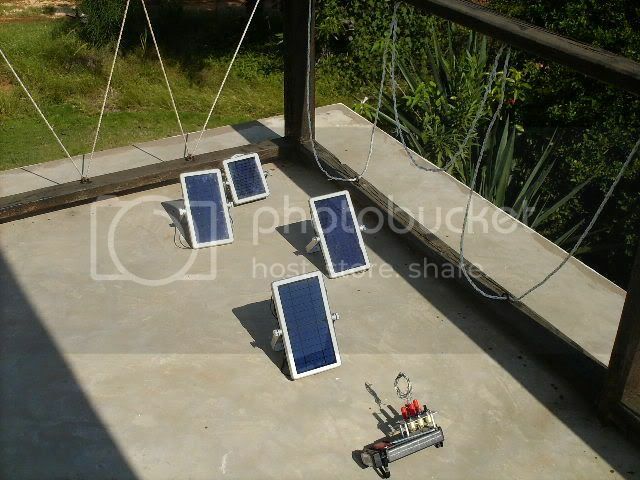 We had a set of attachments to charge cell phones from the solar batteries and another that let us connect directly to the solar panels as well. In fact, we also had a solar/dynamo flashlight/radio which we were using to charge the rechargeable AAs the digital cameras required and a hand cranked dynamo specifically designed for charging cell phones. From what we saw, people in Jamaica were using mostly AAs and D cell batteries but we didn't have a D cell battery bay, only the one for AAs, a set of alligator clips,, and the multimeter. We had cell phone solar. Cell phone solar and AA/D cell charging: that's emergency, camping, and most of the world and it's a scale that is understandable, accessible, and probably affordable. One night, I was talking to some Jamaican kids at Doreen's bar, the local watering hole a few steps away from the guest house. We showed them the lights and explained how the batteries in the lamps could also charge cell phones. They liked that idea a lot. I told them that the large solar lights cost $75 American and the smallest, the one on my backpack, was $30 American. They didn't like that. I said I thought solar lights and cell phone chargers could probably be available for $5 to $10 American and their eyes lit up. Cell phone solar with AA/D battery charging is a useful minimum scale. The price point should be around $10 American or less.